During this episode of Live Fix Radio, we explore the music of rapper, singer-songwriter and Chicago-native Katherine Flaherty (aka K.Flay). We first discovered K. Flay’s cunning blend of hip hop, pop, rock and humorous rhymes back in March at SXSW. We caught up with Flaherty before her show at Subterranean to talk about her Black Friday guilt, the emotional connection with her fans, what she’s learned since SXSW and the silly things she says while onstage. During the show we also share how we discovered the curious backstory of Subterranean, the venue where K.Flay played. It’s a show packed with tons of great stuff like live post-show fan interviews and news about free live downloads and more as you’ll see in the show notes and links below. 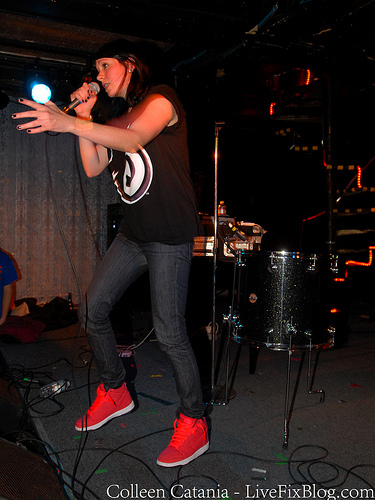 What do you think about K.Flay’s mad rhymes and crazy songwriting skills? Got a question about Subt’s shady history? Want to know more about something we talked about during the show? We invite you to share your concert experiences and thoughts about this podcast in the comments below, so they can be included in a future episode of Live Fix Radio.